Life insurance loans are one of the superpowers of The Privatized Banking Concept. They give you ready access to capital at any time, for any reason. These loans make the cash value of specially-designed life insurance an ideal pool of seed capital for your investing strategy. Providing the opportunity to earn uninterrupted compound interest, leverage your capital, boost your returns, shrink opportunity costs, and accelerate time and money freedom, life insurance loans come close to financial omnipotence. However, many people encounter a mental hurdle when they consider using loans to fund their investments. These concerns would make perfect sense if I were in their position. Here’s why: they don’t want to be in debt. They don’t want to pay to use their money. And they’re concerned that interest owed on a loan will eat into their returns when they put their capital to work. However, much financial fear is based in partial truth and lack of understanding of the full range of impacts of your decisions. And this isn’t your fault. Most “financial education” is a spiffed-up sales pitch offered by “financial experts.” Instead of helping you, it’s a one-way street, viewed through rose-colored glasses, to a particular financial product. Meanwhile, you’re wondering if you will be convinced to buy something you don’t actually want or need. But, consider this, anything worth understanding has layers of complexity, and only those who pursue a comprehensive understanding will gain it. Why isn’t everyone doing this? Everyone who understands, does. When it comes to life insurance loans, a healthy dose of curiosity will help you gain an understanding of a financial process, principles, and truths that will give you advantages most people only dream of. What is the function of life insurance cash value in my financial life? How does life insurance increase my liquidity? What can I use a life insurance loan for? When investing, why would I use a life insurance loan instead of paying cash? How do I increase my return on investment by using life insurance loans with my investments? Why would I pay interest to “use my own money”? Are there times that I should consider another loan with a better interest rate? We’ll give you the number one reason to use life insurance loans. Then, we’ll demonstrate why life insurance loans increase returns on your investments. Packaging it all together, we’ll show you how life insurance loans give you multi-dimensional access to capital that you won’t find anywhere else. Life insurance loans are a part of Privatized Banking, just one step in the greater Cash Flow System. Cash value is part of your savings, a place to store cash. This is your stable, safe money that you save for emergencies and opportunities because it holds its value and provides accessibility. The function is completely different from your investing. With investments, you’re interested in returns. When you invest, you want to grow your money, either through cash flow or by appreciation. But life insurance is not and never will be an investment. While lyour policy cash value does offer growth, it’s primary benefits to you are the stability of value and ready access. You could think of putting your money into cash value life insurance as parking your cars in the garage. Driving the cars is where you put them to work, and where all the risk happens. But no one drives their car 24/7. Between driving excursions, you want a safe, reliable garage to park your car. Maybe you’d like a heated garage with a garage door opener, in a space that doubles as the organization for your tools, storage, personal gym, and a convertible entertaining area. The same goes for your money. You need a safe, reliable place to park your cash between investments, where it also gets the most benefits. When you’re storing your money, you’re not as interested in growth. It’s nice if it grows, but the primary objective is providing you with safety and liquidity, with as many other benefits as possible. The reason it’s difficult to think of your money as living in these two separate roles of storage and working is that when people have cash, the money often seems to burn a hole in their pocket. They want to be 100% invested all the time. But that would be like driving your car 24 hours/day. In contrast, Richard Wilson, who works with family offices serving multimillionaire and billionaire families, discloses that the ultra-wealthy don’t invest in everything that’s pitched to them. Rather, they only invest in the best deals that are right for them, matching their mission and investor identity. If you’re modeling this laser-focused approach and investing only in the best deals, you’ll say no most of the time. There will be opportunities you don’t take while you’re looking for the best investments. And you’ll have time that you are not invested – periods of rest between deals. You’ll carefully conduct your due diligence to pinpoint the best 1% of opportunities that match your criteria. When you’ve located the right deal and are ready to invest, you want capital prepared to deploy immediately to seize the opportunity. Remember, the ultra-wealthy are disciplined. They know precisely what they invest in and are comfortable sitting on cash until the right deal comes along. For this reason, it’s critical to slow down, focus on savings, and figure out the criteria for your best investments. When planning the trajectory of your financial life, the first question to ask yourself is this: where will you store your money? The next question is: how will you access the money when you need it? Cash value that you access through life insurance loans is an excellent strategy that answers both questions. Now that you’re determined to find the best place to store your money between investments, let’s evaluate how life insurance increases your liquidity. There are three primary parts of the type of policy we use the premium, the death benefit, and the cash value. The premium is what you pay into the policy. This is akin to the money you put into savings. The death benefit is the insurance portion of the contract that pays out to your beneficiaries when you die. The cash value is the portion of the death benefit that you can access during your lifetime. The cash value could be compared to the account balance on a savings account. This is the portion of the policy that we refer to as an emergency/opportunity fund because it’s the safe, liquid, and growing money you can use. 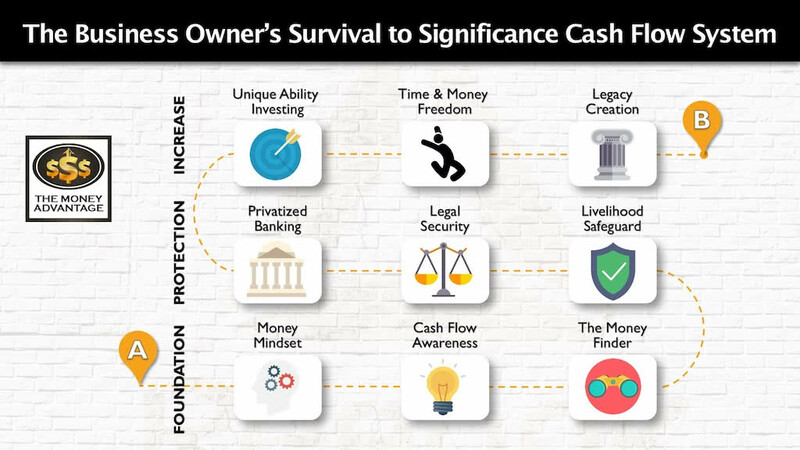 To consider the liquidity that cash value life insurance provides, we’ll focus in on this cash value element. When you put premium dollars into a specially-designed life insurance policy, you have access to high cash value right up front. And we’re not talking about a little bit of money. When you own a cash value policy, you have a growing pool of capital that you can use. It’s almost easier to conceptualize what happens when you fund a life insurance policy by thinking of it this way: the money you put in grows, is available to you, and creates a death benefit. In the early years, most of the internal costs are front-loaded, which is why you don’t have access to the full 100% until a few years later. To access and use your cash value, you have a guaranteed loan provision. This allows you to borrow an amount up to nearly all of your cash value by using your cash value to collateralize a loan from the life insurance company. And, your cash value is contractually guaranteed to never drop in value, so you’ll never have to worry about losing money. 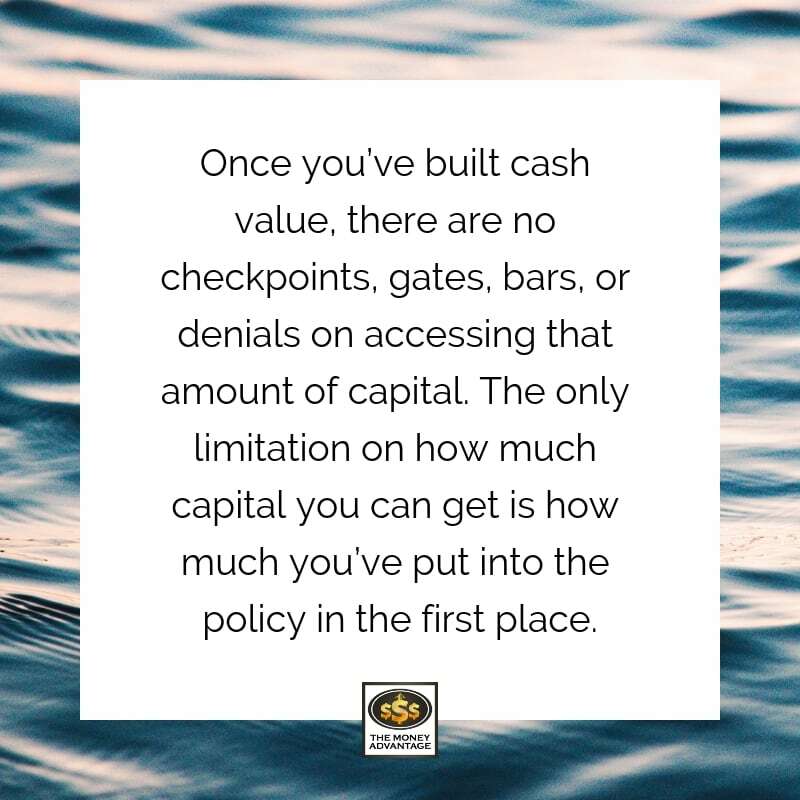 Once you’ve built cash value, there are no checkpoints, gates, bars, or denials on accessing that amount of capital. The only limitation on how much capital you can get is how much you’ve put into the policy in the first place. *Individual policies are based on age, gender, and habits. Individual considerations may improve or delay the timeframe of your liquidity. To further think this through, where else could you store your dollars? And how would that affect your liquidity and your ability to use your money? You could put money directly into an investment. In this case, your cash would not be liquid for the next investment. Instead, you could use your cash to pay off your house, increasing your equity. However, to use that equity, you would have to qualify for a loan or line of credit, which may be denied or called as it best benefits the bank. I think of this as having limitations on your liquidity, because you need to qualify to use your equity. Further weakening this strategy, market fluctuations could cause a loss in value. Many people put cash into qualified retirement plans. The downfall is that to access this cash, you need to use a loan to prevent taxes and fees but can only access up to 50% of your account, or $50K, whichever is less. If you need more money, you’ll need to take a withdrawal, incurring taxes and early withdrawal penalties. Here again, market forces can erode your account value, making qualified plans a poor piggy bank. Or, you could put your cash into a savings account, and then use the savings pot to fund investments. Your money would be liquid but wouldn’t be growing at a rate above inflation. It wouldn’t create a death benefit. And every time you use your cash, you’d be interrupting the compounding, giving up one of the most potent benefits of long-term savings. Considering the alternatives, cash value life insurance is a far superior cash storage option. You build an ever-growing cash value. As a policy owner you have a contractual guarantee to access your cash with a guaranteed loan request. You can’t be denied this loan. That means that you have guaranteed access to capital, to use when the time is right. You won’t pay taxes and penalties for this access. Your money is growing competitively, with compound interest, and you never reset the compounding. Let’s look deeper at what a life insurance loan is, and why it’s a superior method of accessing capital. When you access your cash value, you are not removing your cash value from your policy. Instead, you are taking a loan from the life insurance company, using your cash value as collateral. When you take a loan, the life insurance company places a lien on a portion of your cash value equal to the loan. That portion cannot be used as collateral for another loan until the first loan is repaid. But as the loan is repaid, the lien is equivalently reduced. This releases the same cash value to collateralize another life insurance loan again. Rather than decreasing your total cash value, outstanding loans only reduce your available cash value. Life insurance loans merely reduce the available cash value that can be collateralized for another life insurance loan at the present time. You are not borrowing your cash value – you are borrowing against your cash value. Rather than using your own money, you’re gaining unfettered access to the life insurance company’s capital. Your cash value stays intact, while you deploy other people’s money (OPM) in the ventures of your choosing. Because your own money stays securely intact, at any point in time, with or without loans, your total cash value continues to rise steadily. It does so by earning interest and dividends. This means that, even when you use your money through life insurance loans, you concurrently are earning compound interest. Because your own money continues to grow, you leverage the power of uninterrupted compounding. When you repay the loan, whether incrementally or all at once, you release the cash value to be used again. This capital access is similar to a HELOC. With a HELOC, current balances are secured against the equity of the property and repaid balances free up the equity to collateralize another transaction. 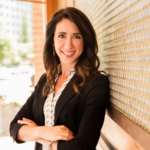 The difference is that, with a HELOC, the underlying value of the property has the potential to fluctuate and even drop in value, while the underlying cash value in your policy will never go down in value. Putting the same money to work over and over again is only possible if you maintain control of your capital. You never give up your cash and put it into someone else’s hands. Instead, it remains at your service, able to be collateralized over and over again. This recycling provides for your money to multitask and increase its velocity. Think of it this way. Within equal timeframes, if you could only use your money once, you’d need to get the highest return possible, say 20%. What if instead, you used the same dollars over and over 20 times, earning 10% each time. If every time you sent out the capital to work for you, it brought back a harvest, you would have created a 200% return. This is the power of velocity. This statement comes from a slight misunderstanding. With a life insurance loan, you’re not using your own money. Rather, you’re borrowing the life insurance company’s funds. When you use the life insurance company’s money, you pay interest to them for the use of their capital. The primary objection to using life insurance loans is usually some form of the question, why would I pay interest to use my own money? The interest accrues, adding to the loan balance, if unpaid. All capital has a cost. Don’t try to look for capital that has no cost, because it does not exist. Using your own cash costs what you can no longer earn on that money. Using someone else’s requires the payment of interest. 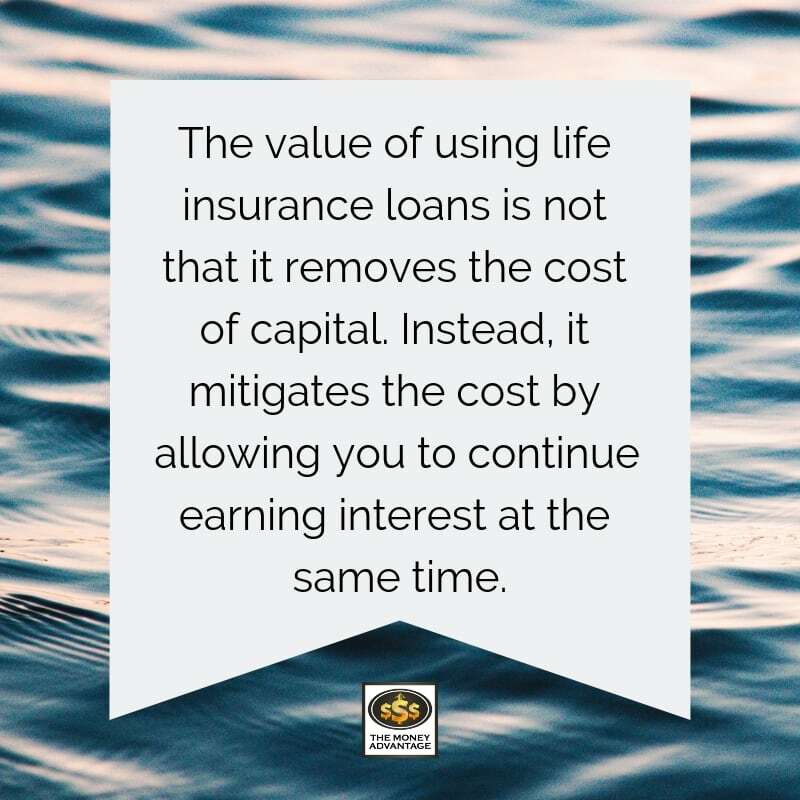 The value of using life insurance loans is not that it removes the cost of capital. Instead, it mitigates the cost by allowing you to continue earning interest at the same time. This minimizes your overall cost of capital and gains you the upper hand of being the bank. The advantage is the ability to control capital and use arbitrage to increase your returns. It’s valuable to look at the sum total of the whole picture, not just the cost of the loan. Another common question that arises out of grappling with the idea of using life insurance loans to invest is this: why would I use a loan from a life insurance policy to invest instead of just paying cash? Wouldn’t paying interest to repay the loan reduce my earnings? The answer requires a further discussion of what happens when you use a life insurance loan. 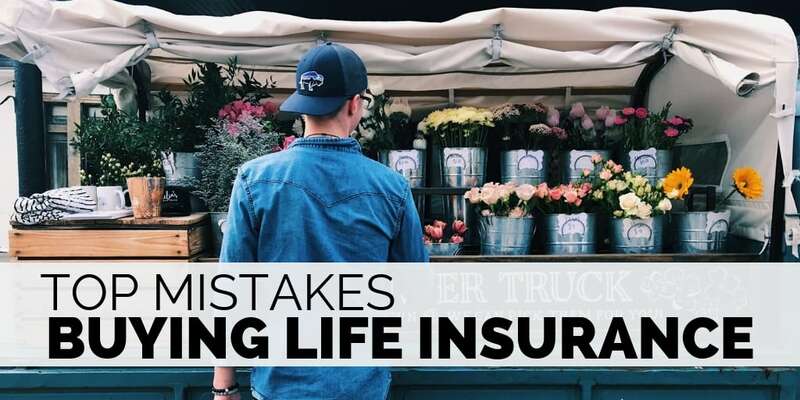 Surprisingly, you’ll discover that using a life insurance loan to fund an investment not only doesn’t cut into your returns, but far to the contrary. Instead, using this loan boosts your investment earnings. While paying cash may seem more straightforward and direct, it comes with a significant disadvantage. When you use your cash, you can no longer earn a return on that money in the original account. When you interrupt the compounding of your money, you stop it’s earning power. You trade it’s return for the return that you can get in an outside investment. Therefore, the opportunity cost of using your own cash is all the future money you could have earned in the original account, had you let it continue to earn compound interest. But when you use a life insurance loan, instead of trading one return for another, you get both, stacking the two returns on top of each other. You continue earning the return in the life insurance, PLUS you earn a return in your outside investment. You don’t have to accept the false dichotomy that you must give up one return to get another. 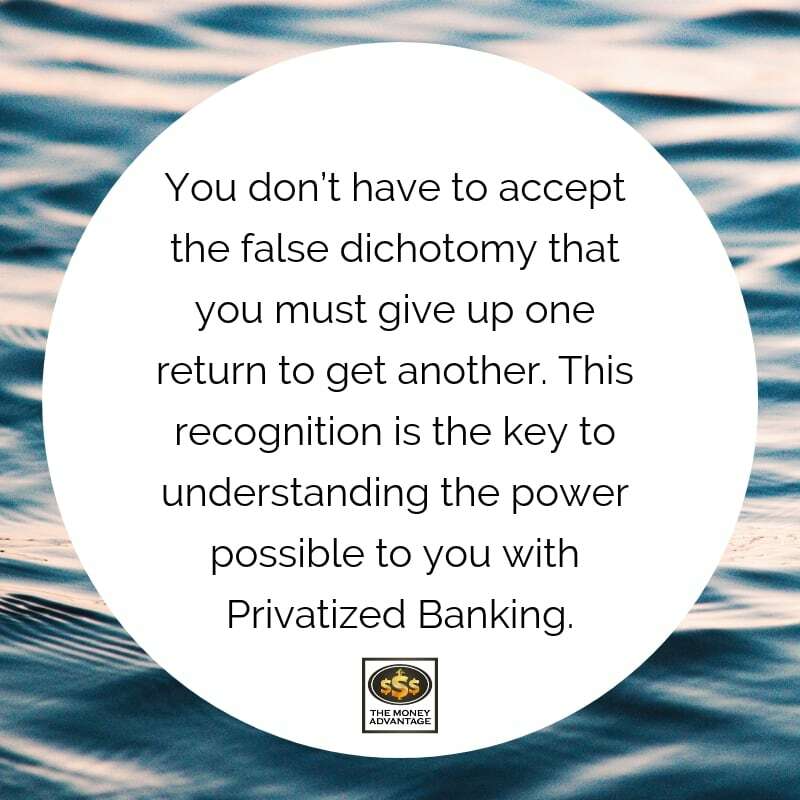 This recognition is the key to understanding the power possible to you with Privatized Banking. Here’s a closer look at how life insurance loans increase your ROI through stacking your returns. Imagine you started by putting cash aside for 7 years. After that, you used your capital to buy a $100K property that will cash flow $1000/month. Let’s compare using life insurance loans vs. paying cash to see how using a life insurance loan increases your returns. 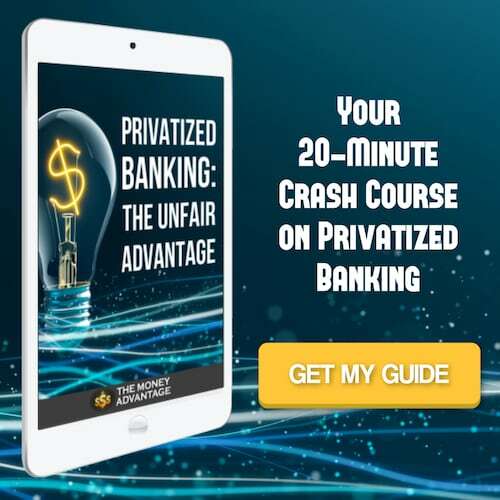 We’ll discuss an overview here, but you can get a full explanation in our Privatized Banking video course. Your first 7 years of deposits of $35,000 each year are made into a bank savings account that earns 1%. Because the savings account is taxable, it’s subject to your 33% tax bracket, reducing your after-tax growth rate to 0.67%. In year 7, you take $100K of cash out of the account, dropping your balance from $323,556 down to $223,556. This account continues earning over the next 30 years. Since you paid cash, you own the property free and clear, so you collect the full $1K in rent each month. 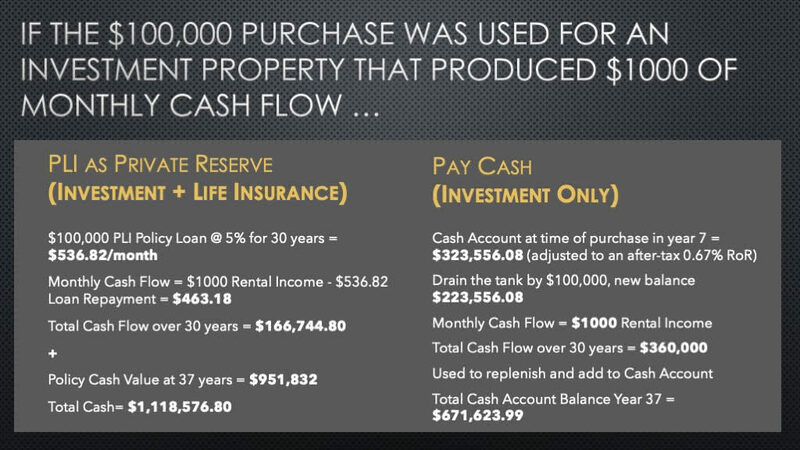 Over the next 30 years, you will receive a total of $360K in cash flow from the property. If you deposit it back into the same savings account as you collect it, and leave it there without touching it again, your ending account balance after another 30 years from the property purchase date (37 years from your initial funding year) will be $671,623. As with the cash-only example, in year 7, you use $100K by borrowing against your cash value with a $100K life insurance loan, accepting the terms of 5% interest over 30 years and generating a monthly payment of $536.82. Because you now have an outstanding loan, your net monthly cash flow will be reduced. You’ll still receive the rent payments of $1K/month, but after paying the life insurance loan payment, you’ll have $463.18/month left over. Summing all 30 years of rental payments, less loan payments, you’ll receive a net of $166,744.80 in cash flow over the next 30 years, after which, the loan will be fully repaid. Yes, this is an amount significantly less than the $360K net cash flow from the property if you paid cash. This is where most people mentally stop with this calculation, but it’s misleading because it doesn’t tell the whole story. Remember, with the life insurance loan option, you are gaining returns in two places, not just one. Now we need to look ahead to our policy’s cash value at the end of the measurement period. Using a life insurance loan provided you almost 2X as much cash at the end of the measurement period. This is because, with life insurance, you earned a higher return, in a non-taxable environment, and didn’t reset the compounding on your money. AND you also created a death benefit, a side benefit that wasn’t even considered in the cash-only example. Therefore, paying interest to use a life insurance loan doesn’t cut into your earnings. Thinking so stems from viewing just part of the scenario. When you look at the full picture, the end result of this example is that even though you paid interest to access your capital through a loan, you nearly doubled your ending balance. Again, the reason life insurance loans work so well to accelerate your returns is that you aren’t trading returns. Instead, you’re stacking returns. You’re earning uninterrupted compound interest in the policy while also earning an external return at the same time. What Can You Use a Life Insurance Loan For? If it’s this good, what exactly can you use a life insurance loan for? The sky’s the limit here too! You can use a life insurance loan for anything – we do, however, only support the use of these loans for legal transactions. It can finance the buyout of another business, fund a marketing campaign, or even cover expenses during months of tight income. It can pay for a medical emergency or a new car. You could use it to make a down payment on a house, pay off loans to free up the monthly payments, or purchase business equipment. You can purchase cash flow-producing assets like real estate, business, land, oil, or gas. Here’s a sampling of some alternative assets you could finance with a life insurance loan: individual turnkey property, multifamily apartments, or mobile home parks. Now, just because you have life insurance cash value, doesn’t mean you’ll want to use this as your sole capital source. There are times you may want to get another loan with a better interest rate. 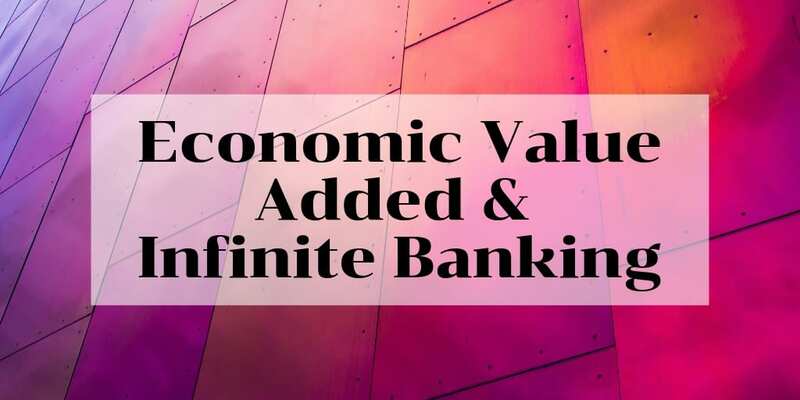 In fact, banks will often collateralize a policy’s cash value (not the death benefit) and offer a loan at their going rate for secured loans. 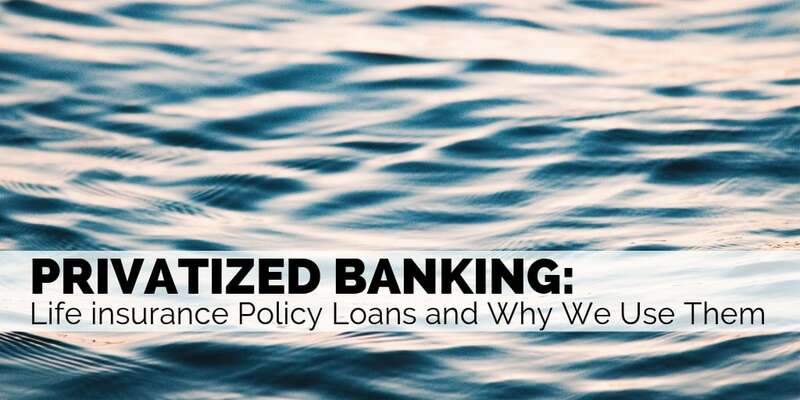 Or, sometimes it makes sense to get a loan from another institution without collateralizing your policy. But, if you know your cash can earn 3 – 5% in your policy when your money is at rest, parked in the garage , why would you pay cash and give up the opportunity to earn that return? The main priority is having control of your capital, which gives you peace of mind and options to make the best decisions. Today, we’ve discussed why you want to use life insurance loans and what they are. The number one reason to use a life insurance loan is that it allows you to maintain control of your capital and earn uninterrupted compound interest. 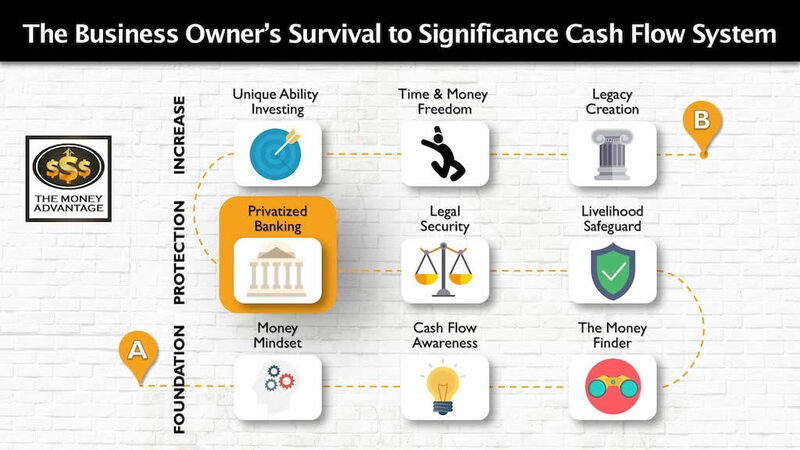 Life insurance cash value is a funding source that provides ready access to capital by offering liquidity through the guaranteed loan provision. Finally, life insurance loans increase returns on your investments by giving you an external return on outside investments, in addition to the internal rate of return that you earn inside the policy. When you deploy capital, you take a loan against your cash value, allowing you to earn a return in two places at the same time. This boosts your investment returns, accelerating time and money freedom. Packaging together the control, guaranteed loan provision, collateralization, uninterrupted compound growth, and the ability to earn returns in two places at the same time, life insurance loans give you a multi-dimensional access to capital that you won’t find anywhere else. Now, it’s up to you to decide how to proceed. The only limit on your access to capital through life insurance loans is how much you put in in the first place.